My significant other and I welcomed home baby Jasper on Sunday, December 6, 2009. 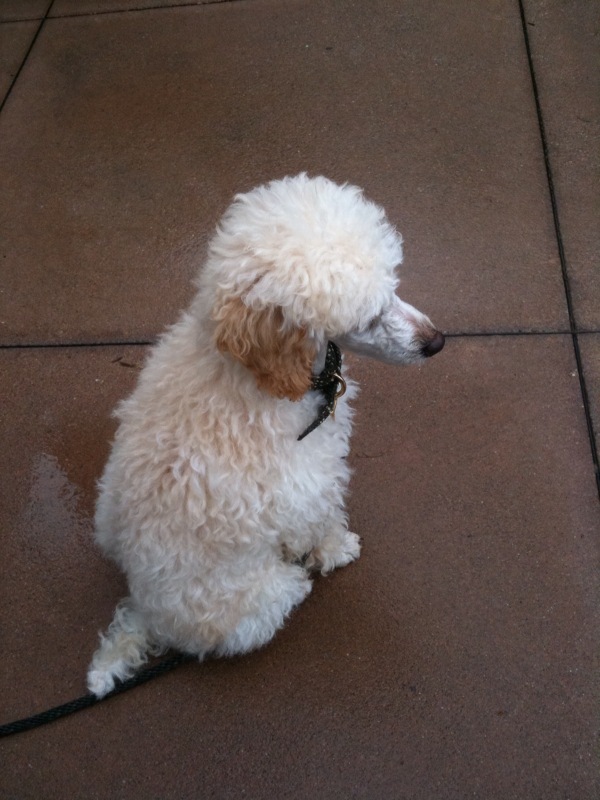 He is a miniature poodle boy born on August 31, 2009. I would have posted the blog sooner, but the first week was busier than I had expected. Fortunately, I had started researching and reading Cesar’s latest book “How to Raise the Perfect Puppy” to help me properly start the relationship with my new best friend. Overall, Jasper has been adjusting amazingly well and learning quickly. 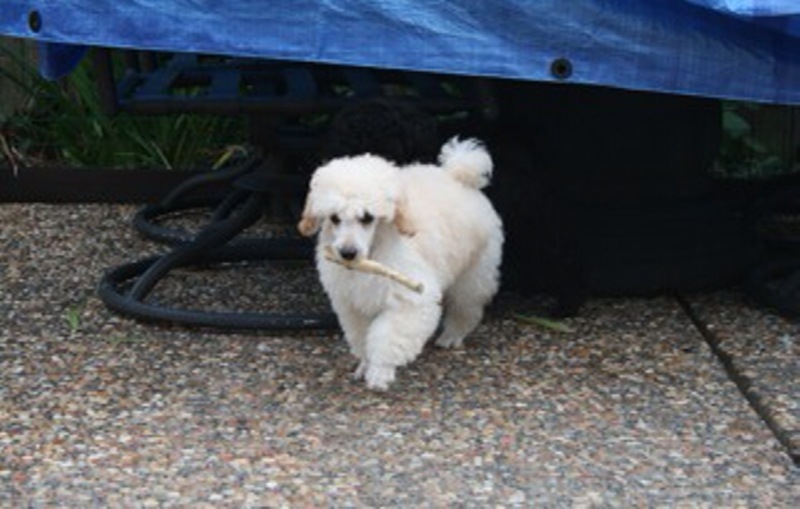 It has only been a week, but a crucial week in a puppy’s formative period, as puppyhood lasts only until 8 months to1 year, and then they enter adolescence until age 3. So the time I have now with Jasper is especially critical, as habits developed now will define who he is as an adolescent and adult. I have always found that learning from other people’s experiences is helpful, so I wanted to write this blog to share my experience with other puppy owners and dog lovers. Your comments and success stories would be most welcomed. Let me start with the important things to do to help a puppy’s transition from living with his mother and littermates to living without them. On the day we picked up Jasper, the breeder gave us a bag of goodies, including the pad Jasper has been sleeping on, that also has his mother’s scent, a couple of his toys, and his dog food. The breeder said it was very important not to abruptly change a puppy’s diet, as it would upset his stomach. Any change we want to make should be made gradually in portions and over time. The breeder also provided us with his birth certificate and health record. Armed with new knowledge and the pertinent paperwork, we were set to bring puppy home. During the two-hour ride home, he did not cry in the car or get carsick. In fact, when he was not napping on my lap (for the record, I was not the driver), he was looking out the window with curiosity. When we arrived in our apartment complex, it was already dark outside. Before entering the apartment, I walked Jasper around our gated community to familiarize him with his new environment. He was very tentative in his steps, but he did walk and sniff around. The moment he entered our apartment, he relieved himself. This was our first mistake with Jasper; but since we did not catch him in the act, we could not reprimand him. Dogs live in the moment, so if you don’t discipline them in the moment, then you will have to find other opportunities to do so. Puppies will be puppies; you can’t get mad at what they naturally do with their bodies. But the accident confirmed in my mind that my top priority has to be housetraining him. We tried to make the first evening as relaxing as possible by feeding him, playing with him, but without overly exciting him. We kept his space confined to the kitchen, so if future accidents happened, the clean up would not be terrible. Jasper did cry for about an hour, as reality finally sank in that he was separated from his mother and littermates. Then it was the dreaded sleep time. Based on everything I had read, I was expecting a sleepless night. I moved his crate to the bedroom, so he wouldn’t be alone. He cried again, as I turned off lights, but I lied on the floor next to his crate and stuck my fingers in so he could lick them. Somehow that was comforting to him, and he became quiet. After he was calm, I got up and moved to my own bed. To my surprise and relief, he remained quiet and slept all through the night. The next few days, I maintained a routine to help Jasper’s adjustment. Puppies need structure and routine. When they are with their pack, there is always a routine with pack leaders providing the structure. My significant other and I are his new pack leaders, so we must provide a routine and stick with it. Part of developing the right routine is taking cue from the puppy himself and learn his schedule – by that I mean his potty schedule. The first couple of days, I was learning and hadn’t quite figured out his schedule or learned his cues, so accidents happened in the apartment. I would be lying if I said I wasn’t frustrated by the accidents. I even called the breeder to solicit advice. Determined to train him well to make our lives easier down the road, I paid particular attention to his movements, when he was circling and sniffing, and any other patterns. Get up between 6-6:30 AM, and immediately take him outside on a leash to go potty. I say the word “Outside” as I dash for the door, so he begins to associate the word with the door and going outside. By now, he has a general area where he goes potty, so that’s where I always lead him to first. Here, I repeat “Go Potty” so he begins associating going potting with that area. As he does his business and immediately after, I praise him like crazy and sometimes give him a treat. I do this, because I want to reinforce him going potty outside. After the potty, we take a short leisurely walk. Around 7 AM, Jasper eats breakfast. Within 5 minutes of eating, I immediately take him outside again, so he can go potty. Food passes through puppies usually within half an hour of eating. With Jasper, I have figured out that he needs to go a lot sooner. I make sure the walk isn’t too rigorous though, because it’s right after eating and hyperactivity can upset his stomach. I take my time outside with him until after he relieves himself, because I know he must go after a meal, so if I come back before he goes, then he will necessarily eliminate indoors. Yes, I did learn this from experience. Once back inside, I play with him a little in his confined area, and then leave him alone. He cries whenever I leave him, even though I may be in sight, but I ignore him, because I don’t want to reward him for crying. As painful as the crying is to hear, it eventually stops when he realizes that he can’t call me back with it. Puppies need to go potty every 2-3 hours, so around 10 AM, 1 PM and 4 PM, I take him out again using the same command words. In between potty times, I either play with him, he naps, or he is next to me while I work. Puppies need to nap a lot, which is great, because it gives me downtime to focus on my work. Between 5-6 PM, Jasper eats dinner, and then I take him outside again. Around 9 PM, I take Jasper out again one last time. Something else I have noticed in Jasper is separation anxiety. Whenever my significant other and I are not physically next to him, even though we may be in plain sight, he would cry and whine. To train him, we practice self-restraint and ignore his heart-wrenching cries. Only when he stops crying will we go pick him up or play with him. This way he associates quiet and calm energy with the reward of our affection. We have also started to train him to spend time alone. We have started to do this gradually, starting with disappearing out of sight into the bedroom or bathroom, then coming out a few minutes later. We have expanded that into 30 minutes and 45 minutes of being away. The other night, we left him so we could go out for a quick dinner, which we limited to about an hour. We don’t have a camera set up yet, but we wagered that he must have cried his heart out. When we came back, he was surprisingly calm and quiet, as if on his best behavior so we would not leave him again. Baby is learning. He still cries at home for our attention, but he is doing it less and less, because he is learning that crying won’t get him the desired attention. While housebreaking has been our first priority, socialization is our other priority. Jasper is on the shy side, but he is also a very curious dog. So we have been taking him outside of our gated community to pet-friendly restaurants, cafes, and of course the vet. He has faired well in all cases. We are starting puppy school this week to further his socialization. It’s hard to believe that Jasper has only been with us one week. Though cries and accidents still happen, they are happening with much less frequency. As new parents, we have learned so much about raising a puppy, and he is adapting so quickly and well. We will report when he is completely housebroken and when there are other interesting experiences to share. If you have good success stories or tips about training a puppy, please do share!